Speculative Romance Author Regina Paul: 5 Reasons Authors Should Color 404 ~ Page Not Found! If you've been watching the news or hanging out online (or Amazon) then you've probably noticed the digital and paperback piles of adult coloring books, and supplies. 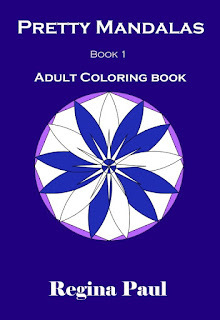 Coloring for adults took off in a big way in April of last year, and experts are saying they don't see any slow down anytime soon. Believe it or not this is a good thing if you're an author. I've actually been experimenting with different coloring pages, and even creating some of my own and the amazing thing is I'm finding benefits beyond what the experts are saying, mainly in huge boosts of creativity. 1. It's relaxing. If you've been trying to work out a scene, or you don't know where you're going with a scene, coloring for a while may help your mind relax enough to find the answer. I know it has for me. 2. It calms the amygdala. The amygdala is the part of the brain that is affected when we become overly stressed which can happen when we're trying to meet a deadline, or we have too much on our plate and we can't calm our mind enough to sit down to write. Coloring calms the part of our brains that deal with panic, and anxiety. 3. Coloring trains your mind to focus. With all the different stressors many writers have including things like a day job, kids, spouse, grocery shopping, house cleaning, you name it, focusing can be difficult. Those who color regularly find they can more easily focus on the things that matter. 4. Coloring turns on the logic part of our brain, and as writers we need that part! Let's face it if we write something that doesn't seem logical, our readers are going to notice. And we don't want that! So, activating this part of your brain can help you with keeping it real in your fiction. 5. Coloring induces a creative mind set. Coloring is creative in and of itself. You can choose a page that really appeals to you and then choose whatever colors you want to. If you're an author (or even if you aren't) and don't already color then you're missing out on a great way to relax, be creative, and have fun! And just for fun, here's a little plug about my new coloring book, Pretty Mandalas available through my bookstore on the website here! It has 25 different mandala designs that you can print out and color for only $2.99!